Back to the Future has inspired all kinds of futuristic technology, including time-traveling DeLoreans, not to mention a serious yen for hoverboards and predictive sports almanacs. Nike harnessed all that Back to the Future love and in 2011 put it into a shoe: the futuristic Back to the Future II Air Mag. As awesome as those shoes were, they lacked one important detail: power laces. 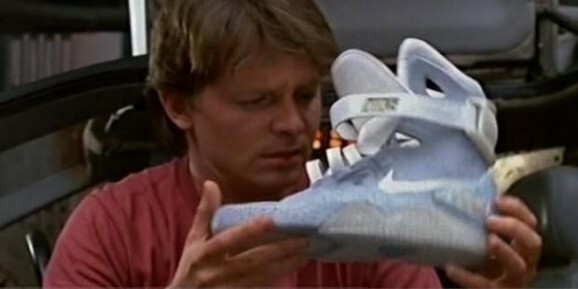 But Nike intends to rectify that situation that in 2015, the year Marty McFly wore those iconic kicks. You remember those shoes, right? They’re like Air Jordans on steroids, boasting LEDs on the outer sole that practically shout “I’m from the future!” Nike’s 2011 version were rechargeable and kept themselves lit for five hours. The shoe manufacturer made 1,500 pairs, which they auctioned off on Ebay. They donated the proceeds to the Michael J. Fox foundation to help “erase Parkinson’s disease from the space-time continuum,” netting a cool $6 million in the process. There must have been some intense bidding wars. And they’re still going, just search Ebay for the shoes. I see a pair of the limited edition 2011 shoes for a buy it now price of $7,500. Others are a more reasonable $2,500. 2013 reproductions of the originals don’t have the light-up Velcro strap and retail for a much more modest $350 per pair. 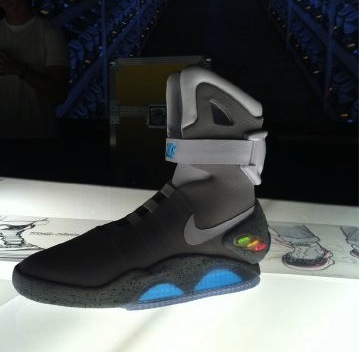 Nike actually designed the shoes used in the 1988 movie after getting a call from Robert Zemeckis and writer Bob Gale. It only makes sense that they’d eventually try making them a reality, especially after a group of diehard fans started a campaign in 2007 to entice them to do just that. The company responded with some Hyperdunks that didn’t quite fit the bill. Originally Nike filed a patent for an automatic lacing system in 2006, but pulled it in 2009, which only made fans more insistent that they keep trying. Finally, after all this time, the dream will become a reality. Nike’s design team emphatically states that we’ll “see power laces in 2015.” They didn’t say they’d be affixed to another version of the Nike Mag shoe, but who cares? I’m holding out for the model with the power laces that also blasts Huey Lewis songs.